This Demonstration shows the area within the distance of a two-link planar-arm robot with configuration . The distance is measured in the , , or norm, with the norm applied either in the workspace or the phase space of the robot. You can change the norm type, the length of the first arm joint and the angles of the two arm joints. The measurement of distance between two configurations of the same robot is necessary for many robot motion planners, such as probabilistic road-map methods and rapidly expanding random trees. The vector norm for is defined as . The special case for is defined as . If a given robot configuration places the tip of the robot at position , the workspace norms are , , and . It is trivial to compute the distance using norms in the workspace; however, these distances are often misleading. The arm's workspace is the unit disk, but the workspace norm shown in Snapshot 1 includes an area inaccessible to the robot arm. 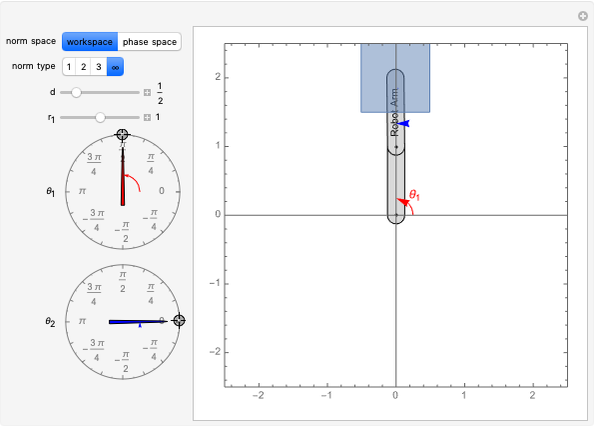 It is more correct to calculate the set of configurations with distance less than in the phase space of the robot and then map this set into the workspace. These norms are , , and . The mapping into the workspace is performed using Mathematica's ParametricPlot command. Notice that lower-order norms are contained by higher-order norms: . 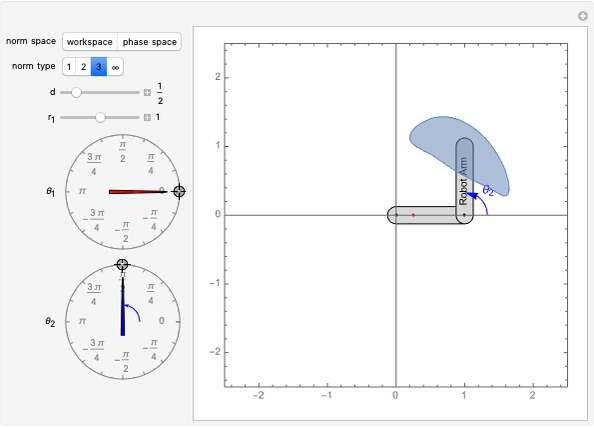 Aaron T. Becker and Benedict Isichei "Distance Norms in Robot Workspace and Phase Space"